Looking for best budget hotels near Shimla Mall Road? The Mall Road, one of the most famous tourist spots in Shimla, is the hub for restaurants, pubs, hotels and everything else. A stroll down the road with a hot cup of coffee in hand and panoramic views of the Himalayas is enough to rejuvenate any tired soul. 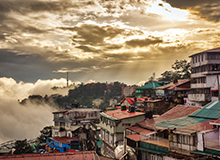 It is for this very reason that Shimla is visited by tourists throughout the year; and to cater to their accommodation needs, there are many hotels near Shimla Mall Road. How to reach Shimla Mall Road? Why book FabHotels near Shimla Mall Road? If you are one of those many people who are looking to escape the busy city, then FabHotels is the right choice for you! Our 4 and 3 star hotels in Shimla Mall Road offer tranquil environment for a rejuvenating stay while ensuring the availability of all modern conveniences. All our hotels in Shimla near Mall Road offer complimentary breakfast and Wi-Fi. You can also expect warm and hospitable staff which is ready to go the extra mile to make sure you feel right at home. The nearest airport is Jubbarhatti Airport, located 23 km from Shimla Mall Road. Café Simla Times, Wake & Bake, Sher-e-Punjab and 45 the Central are some of the best places to eat on Shimla Mall Road. Channa Madra is one of the most famous dishes of Shimla. It is a Himachali dish made with yoghurt and black or white chickpeas. While Mall Road itself is a tourist attraction, some other tourist spots in the region are Jakhoo Hill, Christ Church, The Ridge, and Scandal Point. Shimla bus stand is about 6 km from the Mall Road and it takes about 15 minutes to reach by taxi or bus. The Mall Road is a shopping hub on its own. You can go to Himachal Emporium if you want to buy authentic regional goods. Shimla sees a pleasant weather throughout the year. In summers, the temperature remains between 9 and 28°C, while in winters it ranges from −1 to 10°C with occasional snowfall. Yes, you can find lucrative discounts on all FabHotels in Shimla. Yes, if you are carrying a government ID, you can stay at FabHotels near Shimla Mall Road, with your partner, married or unmarried. 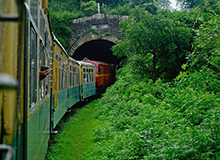 Delhi and Shimla are connected by all means of transport. You can either take a flight or a train. You can also travel by road in HRTC buses, or by your own car.